← Having trouble staying focused at work? The Jacksonville Center for the Arts in Floyd is holding a sign design contest which is open to all comers. 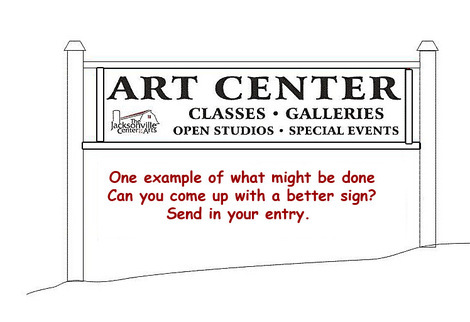 The Jacksonville Center for the Arts wants to harness the creative talents of the Floyd community and the Internet community to design a sign that satisfies a rather challenging requirement. The sign shown above is an example of where we are starting from. totally different, as long as it meets the requirement shown above. five day courses which are a $375 value. The runner-ups will have their choice of any two day course offered at the Center, a value of up to $150. at the Jacksonville Center during a 4:00pm reception for the artists. Go to Jacksonville Center Online for contest rules and the sign templates that must be used for all entries. Just a thought … no need to post this .. . and thanks for the books coming so soon!